For a regular visitor, I am struck as ever by the unusual mix of realities. People throughout the country are visibly striving to make effective economic activities work, generate more income, make new connections. At the same time, it is evident they have a strong affinity with the social norms of broad egalitarianism. They drive both these imperatives against a changing background beyond their control – the loss of Soviet economic aid, the more recent loss of Venezuelan input, and a growing relationship with the USA yet subject to the caprice of the new President. The consequence of these cross-currents are everywhere. Perhaps, the special paradox is the evidence that Raul Castro and Ricardo Cabrisas want to attract and reward investment and business, to take the steps far more likely to normalise relations with the wider world than any doomed strategy of embargoes. They face some internal objections, fears for the defence and culture of Cuba, and a good deal of bureaucratic inertia. Yet, strength will be much more likely to flow from growing national and personal income, flexibility in using considerable individual skills and drive, and connections with neighbours. These are equally the currents of history which will drive the USA to normal relations and you’d think that would be obvious to a businessman in the White House, whatever his ideology or eccentricity. Why do I make these points in the context of a visit? The direct impression is of people striving at every level, whose chance to do well is surely overdue. Hospitality and the quality of food have changed in just a year in Havana but not enough. If that city is to welcome significantly more international guests it will have to do better in hotels and restaurants. It has shown it can improve all the time. The work of the City Historian is genuinely remarkable effort to bring great buildings and heritage back to life. Outside the capital it remains as hard to find good cooking as to find petrol. The best meals were at private farms and the eco-restaurant in the beautiful Terrazas Ecological Community. But if the hard-currency earning potential of the country is to be realized, the need for modern hotels at international standards is clear. As ever, the details counts. For example, the attraction of cruise ship vacations with a visit to Havana is evident to cruise ship companies. While there it is a pity to see a ship the size of a small town moored and blocking the view of the old city, a World Heritage site. 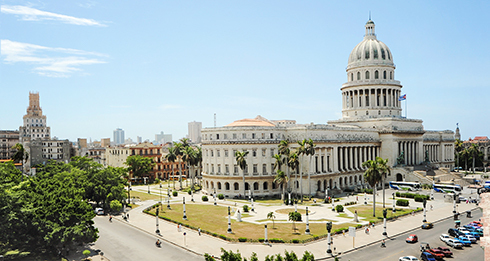 Some urgent thought and infrastructure planning is needed to protect what is most magical in Havana at the same time as attracting visitors by sea. A basis for all these developments are there. Hospitality can spread into golf, convalescence – to any number of areas. And earning more hard currency will drive other national priorities like food production and renewable energy. All work brings good news on this last front. The success of Havana Energy, a Scottish based enterprise is well-worth study. The point about detailed work struck me more on this visit than on any past occasion. To get the right deals at the right level of risk calls for meticulous structuring and for the financial skills familiar in London. Development doesn’t come on a wing end and prayer, but through the disciplines of investment. To be sure, I could feel that enthusiasm – it resonates everywhere – but what is the pressing need? The opportunists to do the job.